What's New in Google Voice? The new user interface now looks like a mobile app: brightly colored icons and not much in the way of text labels. A little poking around quickly reveals how to navigate records of calls, text messages, and voicemails. “Send message…” appears prominently in the top left corner, and in several other places. Apparently, Google wants to encourage text messaging, which probably costs it next to nothing compared to voice calls. On the plus side, everyone can now send photos via SMS message, even Sprint customers. That feature was missing in the previous (legacy) Google Voice. Google also notes that in the new version, “conversations stay in one continuous thread.” To some degree that was possible in the legacy version, but conversation threads are much cleaner and clearer now. One big downside of the new Voice is that placing a voice call from the desktop is much more cumbersome, and in some cases, impossible. 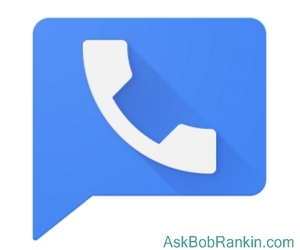 To call someone you've already talked to, first open the Google Voice tab for Calls or Voicemail. Click on a previous call or voicemail with the other person. At the BOTTOM right, click the link to call that person, then choose a linked number to use for the call. If you have previously shared a text message with someone, placing a voice call to that person works just a bit differently. Open the Google Voice tab for Texts, and click on a previous conversation with the other person. At the TOP right, click the phone icon to call that person, then choose a linked number to use for the call. So how do you call someone you haven't called or texted before? You can't! Google's help file says: "To call someone you haven’t called before, use your phone instead." Wow. The previous (legacy) version of Google Voice had a big red button labelled CALL. You could simply enter any number, and off you go. I can't figure why the smart people at Google would remove the ability to easily make a VOICE call in an application called Google VOICE. The “Search” function at the top of the new Voice interface searches the text of voicemails that have been converted to text, as well as text messages. However, it searches only one type of message at a time, not voicemails and text messages in one search. Call records can be searched by caller’s name only; you can’t find call records by searching for a phone number. In the old version of Voice, the History link pulled all your texts, calls and voice messages together on one screen. The options for Archive, Mark as Spam, Block Number and Delete are still there, but you have to select a message, then click the three little dots on the right, just under your profile icon to find them. Google Voice settings are buried under the three dots that appear on the LEFT side of the screen. In my opinion, all of these things were easier to find in the old version. But hey, that reminds me of my favorite feature of the new Google Voice. Click those three dots on the left, scroll down, and under Settings, you'll see the option for "Legacy Google Voice." Click that, and a new window will open with the familiar legacy version of Voice. That big red CALL button (the one that lets you call ANY number) will be there. You'll also regain another feature that's gone from the new version. The History link shows everything (texts, calls, and voicemails) on one screen. Overall, this update appear pretty slap-dash, with most of the emphasis on mobile functions such as picture and text messaging. The UI tweaks align the desktop version with the mobile version of Google Voice, making programmers’ lives easier. And it's good to finally be able to send pictures in a text message. Google now has three messaging apps: Google Voice, Hangouts, and Allo. Each has its pros and cons, and limitations. The instant-messaging app Allo, for instance, can’t send text messages or place voice calls; it’s not even available for desktop computers. Users are split up among the three apps, and switching from one to the other has a learning curve. This fragmentation may be typical Google experimentation; throw some half-baked “beta” apps out there and see which one(s) people use most. But it’s very confusing and frustrating for many users. If Google wants to get serious about competing against Apple’s iMessage, it should integrate all calling and messaging functions into a single app. Most recent comments on "The New Google Voice: Love or Hate?" Jumped to use Google Voice when first offered and even dropped my landline. I do not use a cell phone so Voice kept me connected. Then Hangouts; I never got the 'hang' of it. Now with the new Google Voice its best option IS the Legacy Google Voice. If Google is working on reducing their market share, they are headed in the right direct. I have used GV for years, living in a foreign country when it was 1¢/minute, it was great! Then it went Free! I have not had the "New" GV installed... yet, but I have noticed during the past month that 98% of calls from the computer just don't go thru.. no ring, no message, just dumps the no-call after 45 seconds. I call a lot of different numbers (mostly to elected officials) but I notice that if the name/number isn't in my Contact List, it doesn't seem to save a record of that number called. GV was great and I hope it continues to be.... even if they put the 1¢/minute back on. I think it's amusing and sad to watch companies get large and then wander towards entropy. I'm not seeing Google immune. They have great products initially and then they collectively lose their mind. Products get complicated, opaque and head towards irrelevance. Android is much more complicated and harder to use - at least as a phone than the earlier releases. They drop Picasa in favor of some cloud based confusion. An as OP noted, Google Maps and now Google Voice. They need to hire ordinary people to Beta their products and listen to them. The sole use I make of the new Voice is to transfer to Legacy. I am grateful to Google for the service, and they have a right to destroy it, though the cost to a large number of users would be embarrassing. I cannot seem to find the "Legacy" button on my Googlevoice. After I hit the three dots, the only options that show up are: "People and Options; Archive; Mark as Spam; Block Number;" and "Delete." No "Legacy" shows up. As a result, I cannot call out to any new numbers, only the ones I already have. Unfortunately, the feature to "send photos via SMS message" can only be achieved if the file resides on the cloud. I am finding out that such image files cannot be pasted from local device memory or drive. I found the Legacy function. "Overall, this update appear pretty slap-dash..."
"Overall, this update appearS pretty slap-dash..."
Hate it. You best summarized it as "Overall, this update appear pretty slap-dash." Google must be taking lessons from the Windows 10 designers. One function "old" Voice replaced by 3 functions: "new" Voice, Contacts, Hangout. Fortunately I found the Legacy Voice. There must have been a great hue and outcry about this update 'cause this morning (Mar09) I find that my link to the "new" Voice directs me to the "old" Voice. Good article, Bob, but a couple of things seem different in my iPhone version of the app. (1) I can't find any legacy option. Maybe this is an Android-only ability? (2) Tapping the dialer icon on the bottom row calls up a number keypad with which I can dial any number, including numbers I've never called before. Weird that this is in the iOS app but not Android, since Google owns the latter. But I just tried it to make sure, and it definitely works. Maybe this is a new update that rolled out just add you were paying your article. It does seem like a bug, not a feature. Google began as a song and went to pot. Looks like a case of bard to voice. I HATE the new Google Voice. They took something that was already a challenge to use and made it worse. I am searching for a new app to use that doesn't involve switching between new and old and different apps just to make a call. voice. The new voice: an abomination. It's important to specify the GVoice platform when posting... both the desktop and phone interfaces are completely new. The "legacy" option is only available in the desktop interface. It's not possible to revert the phone interface and, imho, it's worse than the new destop versions. In addition settings verbage has changed and can be misleading. I only use G-Voice for international contact. International texting was previously unavailable, so I wonder if that has been enabled in the "new" version. That would be "nice"! Looking around their Help screens just confused me more. Have they linked Legacy back to the new Voice now and taken away the Call feature? I'm not sure how I made phone calls last year using Google Voice without a "special" phone number! My settings don't show any linked phones. Too many cooks spoil the broth - Et tu, Google? Remember the k.i.s.s principle! You have it right Gary in SE Wisconsin why would Google want to improve Voice when it was so simple to use the way it was especially for us Seniors how non understanding of all ages in the general public. Gary you r right the kiss principle so TRUE. GOOGLE WE R ALL NOT 21 YEARS OLD ANY MORE. We were not raised with this technology. Think of how it affects us Seniors.